October 16, 2011 - Pratt & Whitney and Rolls-Royce, the global power systems company, announce a restructure of their participation in IAE International Aero Engines AG (IAE), which produces the V2500 engine for the A320 family of aircraft. Under the terms of the agreement, Rolls-Royce will sell its equity and program shares in IAE to Pratt & Whitney for $1.5 billion. Pratt & Whitney intends to discuss a possible offer of a portion of these shares with its IAE partners MTU Aero Engines AG (MTU) and Japanese Aero Engines Corporation (JAEC). In addition, Rolls-Royce shall receive an agreed payment for each hour flown by the current installed fleet of V2500-powered aircraft for fifteen years from completion of the transaction. Under the continuing leadership of Pratt & Whitney, JAEC and MTU, IAE will continue to deliver the same high-quality product and customer support without interruption. Rolls-Royce remains committed to IAE and its customers and will continue to be responsible for the manufacture of high-pressure compressors, fan blades and discs as well as the provision of engineering support and final assembly of 50 percent of V2500 engines. Since its creation almost thirty years ago IAE has become a major force in international aviation with approximately 4,500 V2500 engines in service and approximately 2,000 on order. The IAE V2500 is a two-shaft high-bypass turbofan engine which powers the Airbus A320 family (A320, A321, A319 and the Airbus Corporate Jet), and the McDonnell Douglas MD-90. International Aero Engines is a consortium backed by four aero-engine manufacturers, formed in 1983 to produce the engine. FAA flight certification for the V2500 was granted in 1988. Pratt & Whitney and Rolls-Royce also announced an agreement to form a new partnership to power future mid-size aircraft (120 ? 230 passenger aircraft). The two companies will establish a joint venture company, in which each will hold an equal share, to develop new engines for the next generation of aircraft that will replace the existing mid-size fleet. The new venture will draw on the most-advanced technology from two world-class companies to drive enhanced performance for this fast-growing segment in which worldwide demand for around 20,000 new aircraft (or nearly 45,000 engines) is predicted over the next 20 years. This new joint venture will focus on high-bypass ratio geared turbofan? technology. In addition, the venture will collaborate on future studies for next generation propulsion systems, including advanced geared engines, open rotor technology and other advanced configurations. The new collaboration brings together complementary technological resources and is designed to offer the best, most competitive response to customer demand for the next generation powerplant in the mid-size segment. The collaboration could bring about significant value for customers, as both parties are able to benefit from each other?s strengths. The new joint venture between Pratt & Whitney and Rolls-Royce also benefits from the success of the V2500 and the PurePower engine in establishing a broad customer base. It builds on the long-standing and successful partnership between Pratt & Whitney and Rolls-Royce in the mid-size segment. JAEC and MTU, partners of IAE and the PurePower PW1100G-JM (Geared Turbofan?) 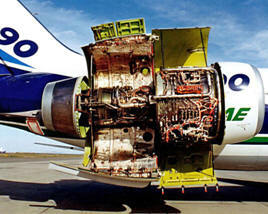 engine program for the Airbus A320 New Engine Option (neo), also intend to join the new collaboration. ?Today?s announcement charts a clear course for the future of Rolls-Royce in the important mid-size aircraft segment,? said Mark King, president, Civil Aerospace, Rolls-Royce. ?We are building on many years of successful collaboration with Pratt & Whitney in this segment to develop advanced aero engines, which we are confident will set new standards in aviation technology, performance and fuel efficiency.? ?These agreements position Pratt & Whitney, JAEC, MTU and IAE to best serve the needs of their customers for all A320 aircraft family,? said Todd Kallman, president, Commercial Engines & Global Services, Pratt & Whitney. ?We are delighted to collaborate with Rolls-Royce with its complementary capabilities as we look forward to the next generation of aircraft engines that will offer even greater operational and environmental benefits.? In addition, Rolls-Royce will make a modest financial investment in the PurePower PW1100G-JM (Geared Turbofan) engine for the Airbus A320 New Engine Option (neo) program. The current IAE fleet of approximately 4,500 engines represents approximately 112 million lbs of installed thrust, has an average age of 7 years and currently operates around 3,000 hours per year each ? delivering more than 12 million flying hours per annum.